Get custom email @your_company.com including calendar, docs, video meetings and more with access from your phone or tablet. 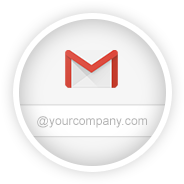 Personalize your email by getting email addresses at your domain. Create addresses for your team like joe@your_company.com. Get control of spam – Advanced filters keep spam from your inbox so you can focus on messages that matter. Keep all your important email – 25 GB of storage per user lets you keep just about anything you think may be important down the road. Unified communications – Email, instant message, and make high-quality voice and video communication without launching a separate application. 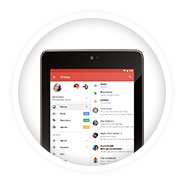 Essential messaging apps – Gmail and Google Calendar are included. Continuous innovation – Put the web’s rapid pace of innovation to work for your business. Lower cost – No hardware, software or patches, so you save money. Universal access – Access your data from anywhere. Connect with IMAP, POP from mobile devices. 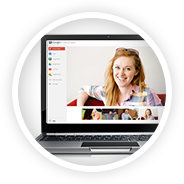 Enterprise-class service – Google Apps includes a 99.9% uptime SLA. Secure infrastructure – Multiple layers of protection keep your business data safe and secure.